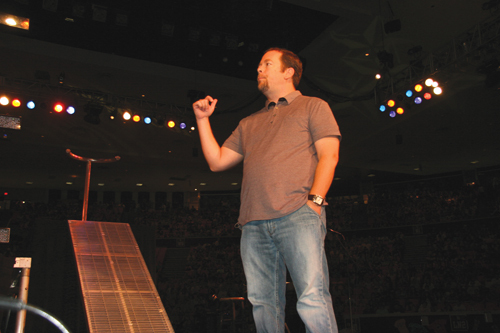 University of Oklahoma basketball coaches Jeff Capel and Sherri Coale would probably be thrilled if they could fill OU’s Lloyd Noble Arena with a crowd that produced the noise and enthusiasm generated by the 10,000 attending the State Youth Evangelism Conference in Norman Aug. 7-8. More than 300 students made decisions for Christ, including 42 professions of faith. With “Reaching MySchool for Christ” as the theme of the two-day youth event, students clapped and swayed to the resonant, electric sounds of the Jeff Johnson Band, Skillet, Group1Crew and BlueTree and heard three messages from Chad Norris (no, he’s not related to him), one of the founders of Wayfarer in 2000. As the bell rang for each session, and the school bus rolled into the arena, the students were challenged by Baptist General Convention of Oklahoma student ministers Norman Flowers, James Lankford, Andy Harrison and Todd Sanders to make a difference in their schools in the coming year. Lankford, the school principal, encouraged the students to set aside a block of time each day for a quiet time, and, based on Micah 6:8, to promote justice, show mercy and walk humbly with God at their schools. Flowers, the school janitor, suggested the students write down the name of one person and begin to serve that person and share Christ with him or her. Flowers also summoned the students to pray for their rival schools, that God would move on those campuses. Harrison, the shop instructor, who recreated the part of the Frenchman he portrayed at Falls Creek, Guy D’Revue, taught the students “one-verse” evangelism, based on Romans 6:23, that they can easily share with their fellow classmates. As the music that rocked the arena subsided, Norris captured the students’ attention with brief messages that encouraged them to not only believe in Jesus, but also to follow and to know Him. He explained that when you surrender your life to Jesus, He becomes the owner. “Do we understand evangelism as a devoted, loving, passionate relationship with the King?” he asked. Norris suggested most Christians live a defensive life rather than an offensive one. Citing Jeremiah 7:9, he said most Christians don’t smoke, drink, cuss or do 12 other things, but are they doing anything? Norris explained that the Hebrew word for “know” is the word used for intimacy inside of marriage. “There is an enormous difference in believing in the cross and Jesus and knowing God,” he emphasized. “If Peter had lack of faith when he started to sink, how about the 11 in the boat?” he asked. “To wait upon the Lord means to get out of the boat. If you’re waiting in the boat for the Lord to bring someone into the boat, you’re going to be there until you’re 99. In his final message, Norris said God baffles him. He noted Jesus isn’t interested in us being comfortable, but in changing the world for His Namesake. Before the conference started, 1,300 youth from 53 churches worked at area schools to help clean up, watering and fertilizing shrubs, picking up trash, cleaning playground equipment and painting. Almost 1,500 students attended preconference sessions at Moore, First Friday afternoon, which included topics from how to reach your school, making the college transition for junior and seniors, helping hurting students and guys and girls only sessions. Churches were encouraged to bring school supplies for needy students. On Saturday, during lunch time, each church picked up backpacks and filled them with school supplies to take back to their community to give away. The churches were also encouraged to purchase other backpacks to give to the schools to help with those in need. During the lunch break, youth groups tailgated in the parking lot, enjoying activities including youth worship bands and His Son featuring Vince Carter, iGo reunion, a remote radio broadcast from The House FM and the BGCO block party trailer. Flowers said churches can continue to challenge students with the MySchool theme back at home. “We are providing youth ministers free downloadable four-session Bible study material, two videos and clip art,” he said. “This can be found on the YEC page at www.SKOPOS.org.